Radio Atlantis first broadcast from the MV Mi Amigo from 15/7/73 until 15/10/73 under a deal with Radio Caroline, and then from the MV Janine (pictured), anchored in the international waters of the North Sea off the Dutch/Belgian coast. This ship was formerly used by the ill-fated Radio Condor which was to broadcast a non-commercial format of religious/ humanitarian programmes with "happy" music, but never succeeded. Radio Atlantis began test transmissions from the Janine on 270 metres on 24/12/73 and regular programmes began on 7/1/74 with a mixture of Flemish and English. The sound of the station was exciting and it captured some of the magic of the offshore stations of the sixties with a Top 40 format mixed with oldies and album tracks. This is probably due to the fact that the whole operation was run by real radio enthusiasts and this was reflected in the station output. Radio Atlantis used various frequencies in the AM band and eventually closed down on 31/8/74 due to the Dutch Marine Offences Act. 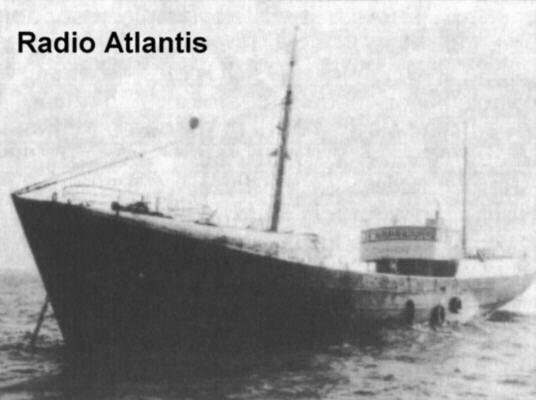 Radio Atlantis returned as a Restricted Service Licence in December 1998 / January 1999 from the MV Ross Revenge anchored off Queenborough, Isle of Sheppey, England, and tried to capture the original sound of the station with a very worthwhile broadcast. The museum has some excellent examples of Radio Atlantis.